Item Number: 62-108 16959 Actual Weight: 7 lbs. 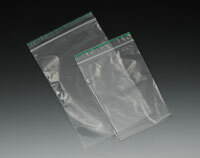 Environmentally friendly bags meet ASTM D5511 for disposal of these bags in anaerobic solid-waste-treatment plants. Premium zipper bags are made of low density polyethylene and meet FDA and USDA specifications for food contact.